Panyas is tropical grass plant with sword-shaped leaves and hard white spherical seeds that are used as natural seeds and nuts beads. Its seeds, also commonly known as “Job’s tears“, “Mary’s tears“, “bead plant“, or “tear drops“, take on the shape of tear droplets and are pearly white, or grayish in color. This wild grass is native to most tropical regions and has a scientific Latin name: Coix lacryma-jobi. In the Philippines, this plant is locally named panyas owing to its resemblance to a miniature corn plant, as it should since it is of the corn family. This plant’s teardrop shaped, light to dark gray shiny seeds are used as beads –sun-dried, polished, center-drilled for easy stringing. The inside of each seed is so soft that it is easily pierced. 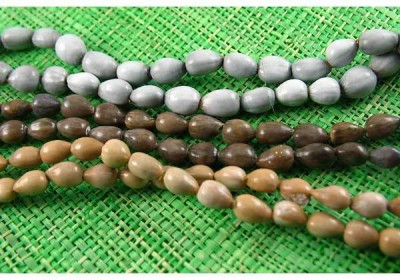 Hence, an instant bead.With the the ongoing popularity of the “Go Green” movement especially in the fashion industry, natural and organic beads are now beaded with the recycled glass beads, limestone coral beads, and gemstone beads. Job’s tears beads are hitting more jewelry shops now as the “fusion look” continues to captivate today’s frugal designers. What more, these beads can be made into lovely rosaries with an exotic horn cross pendant at one end. These beads can be dyed too and strung into necklaces, or fashioned into bead curtains and colorful wall decorations. In whatever creative way you display them, the seed is perfect for stringing and that’s what makes this plant so trendy to the bead world. Make your own panyas necklace now, and you are sure bound to make an interesting and unique conversation piece.